The bump growth has definitely slowed down, although I still have a lot of people convinced there is twins in there (3 under 18 months . . . ahhhh!) I have done quite a bit of maternity clothes shopping as I am finding them a lot more comfortable and all I have from my last pregnancy is shorts and vests. My skin is definitely feeling better and my hair is refusing to let go of any odd strands and getting thicker. I am not a believer in the pregnancy glow, but I am feeling very healthy. I am having the same odd and annoying symptom I had with my last pregnancy where my left ear gets blocked and I can unpop it by turning my head upside down (nothing else works) yet the moment my head is the right way up it is blocked again. It happens mostly at work or if I am out walking, which makes doing any exercise very difficult! It didn't go last time until I had the baby so looking forward to another 22 weeks of blocked ears! It's not too late to enter my giveaway and win some Palmer's cocoa butter goodies, just take a guess whether you think Squish is a little brother or sister for Dylan - all will be revealed very soon! Does it feel like it has flown by for you? It is dragging for me! I think once I get my scan out the way and know if everything is ok then maybe this be better but at the moment I just feel like it is taking forever to get to that point. 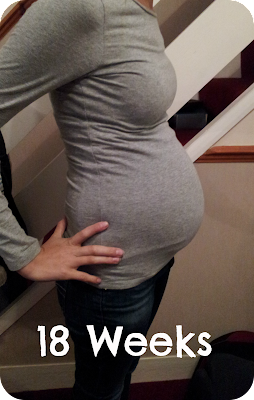 It is really going fast for me and I love being pregnant so hoping the second half doesn't go by so quickly! You have a lovely bump! Lovely Bump! Its mad how our babies grow so fast but you still see them as a baby until you put them next to a newborn! You are the first person to tell me the ear thing is not just me! Very reassuring! I think it might be a lil girl, only coz it'll be so lovely to see Dylan playing with and helping his lil sister out....but I don't have a clue what it could be if you think technically.!!!! Only two days now until we find out and I am getting very impatient! As long as baby is healthy I honestly don't mind though! I had no idea you were pregnant, sorry! We went to Brazil in July for the whole summer. When I visited your blog, I had to double check the date before saying congratulations to make sure that you were pregnant again! Gorgeous bump. I have just stumbled on your lovely blog. I love reading on the happenings of other mums. I read so many when I was pregnant the first time it is lovely to be able to record it myself this time!